Abraham Ortelius (/ɔːrˈtiːliəs/; also Ortels, Orthellius, Wortels; 14 April 1527 – 28 June 1598) was a Brabantian cartographer and geographer, conventionally recognized as the creator of the first modern atlas, the Theatrum Orbis Terrarum (Theatre of the World). Ortelius is often considered one of the founders of the Netherlandish school of cartography and one of the most notable figures of the school in its golden age (approximately 1570s–1670s). The publication of his atlas in 1570 is often considered as the official beginning of the Golden Age of Netherlandish cartography. He is also believed to be the first person to imagine that the continents were joined together before drifting to their present positions. The Google Doodle of May 20, 2018, recognised Ortelius's endeavours, particularly the Theatrum Orbis Terrarum. Ortelius was born in the city of Antwerp, which was then in the Habsburg Netherlands (modern-day Belgium). The Orthellius family were originally from Augsburg, a Free imperial city of the Holy Roman Empire. In 1535, the family had fallen under suspicion of Protestantism. Following the death of Ortelius's father, his uncle Jacobus van Meteren returned from religious exile in England to take care of Ortelius. Abraham remained close to his cousin Emanuel van Meteren who would later move to London. In 1575 he was appointed geographer to the king of Spain, Philip II, on the recommendation of Arias Montanus, who vouched for his orthodoxy. He traveled extensively in Europe, and is specifically known to have traveled throughout the Seventeen Provinces; in southern, western, northern, and eastern Germany (e.g., 1560, 1575–1576); France (1559–1560); England and Ireland (1576), and Italy (1578, and perhaps twice or thrice between 1550 and 1558). Beginning as a map-engraver, in 1547 he entered the Antwerp Guild of Saint Luke as an illuminator of maps. He supplemented his income trading in books, prints, and maps, and his journeys included yearly visits to the Frankfurt book and print fair where he met Gerardus Mercator in 1554. In 1560, however, when travelling with Mercator to Trier, Lorraine, and Poitiers, he seems to have been attracted, largely by Mercator's influence, towards the career of a scientific geographer. In 1564 he published his first map, Typus Orbis Terrarum, an eight-leaved wall map of the world, on which he identified the Regio Patalis with Locach as a northward extension of the Terra Australis, reaching as far as New Guinea. This map subsequently appeared in reduced form in the Terrarum (the only extant copy is in now at Basel University Library). He also published a two-sheet map of Egypt in 1565, a plan of the Brittenburg castle on the coast of the Netherlands in 1568, an eight-sheet map of Asia in 1567, and a six-sheet map of Spain before the appearance of his atlas. In England Ortelius's contacts included William Camden, Richard Hakluyt, Thomas Penny, puritan controversialist William Charke, and Humphrey Llwyd, who would contribute the map of England and Wales to Ortelius's 1573 edition of the Theatrum. In 1578 he laid the basis of a critical treatment of ancient geography by his Synonymia geographica (issued by the Plantin press at Antwerp and republished in expanded form as Thesaurus geographicus in 1587 and again expanded in 1596. In this last edition, Ortelius considers the possibility of continental drift, a hypothesis proved correct only centuries later). In 1596 he received a presentation from Antwerp city, similar to that afterwards bestowed on Rubens. His death on 28 June 1598, and his burial in the church of St. Michael's Abbey, Antwerp, were marked by public mourning. The inscription on his tombstone reads: Quietis cultor sine lite, uxore, prole ("served quietly, without accusation, wife, and offspring"). On 20 May 1570, Gilles Coppens de Diest at Antwerp issued Ortelius's Theatrum Orbis Terrarum, the "first modern atlas" (of 53 maps). [Note 1] Three Latin editions of this (besides a Dutch, a French and a German edition) appeared before the end of 1572; twenty-five editions came out before Ortelius's death in 1598; and several others were published subsequently, for the atlas continued to be in demand until about 1612. Most of the maps were admittedly reproductions (a list of 87 authors is given in the first Theatrum by Ortelius himself, growing to 183 names in the 1601 Latin edition), and many discrepancies of delineation or nomenclature occur. Errors, of course, abound, both in general conceptions and in detail; thus South America is initially very faulty in outline, but corrected in the 1587 French edition, and in Scotland the Grampians lie between the Forth and the Clyde; but, taken as a whole, this atlas with its accompanying text was a monument of rare erudition and industry. Its immediate precursor and prototype was a collection of thirty-eight maps of European lands, and of Asia, Africa, Tartary and Egypt, gathered together by the wealth and enterprise, and through the agents, of Ortelius's friend and patron, Gillis Hooftman (1521–1581), lord of Cleydael and Aertselaer: most of these were printed in Rome, eight or nine only in the Southern Netherlands. In 1573, Ortelius published seventeen supplementary maps under the title Additamentum Theatri Orbis Terrarum. Four more Additamenta were to follow, the last one appearing in 1597. He also had a keen interest and formed a fine collection of coins, medals and antiques, and this resulted in the book (also in 1573, published by Philippe Galle of Antwerp) Deorum dearumque capita ... ex Museo Ortelii ("Heads of the gods and goddesses... from the Ortelius Museum"; reprinted in 1582, 1602, 1612, 1680, 1683 and finally in 1699 by Gronovius, Thesaurus Graecarum Antiquitatum ("Treasury of Greek Antiquities", vol. vii). In 1579 Ortelius brought out his Nomenclator Ptolemaicus and started his Parergon (a series of maps illustrating ancient history, sacred and secular). He also published Itinerarium per nonnullas Galliae Belgicae partes (at the Plantin press in 1584, and reprinted in 1630, 1661 in Hegenitius, Itin. Frisio-Hoil., in 1667 by Verbiest, and finally in 1757 in Leuven), a record of a journey in Belgium and the Rhineland made in 1575. In 1589 he published Maris Pacifici, the first dedicated map of the Pacific to be printed. Among his last works were an edition of Caesar (C. I. Caesaris omnia quae extant, Leiden, Raphelingen, 1593), and the Aurei saeculi imago, sive Germanorum veterum vita, mores, ritus et religio. (Philippe Galle, Antwerp, 1596). He also aided Welser in his edition of the Peutinger Table in 1598. Contrary to popular belief, Abraham Ortelius, who had no children, never lived at the Mercator-Orteliushuis (Kloosterstraat 11–17, Antwerpen), but lived at his sister's house (Kloosterstraat 33–35, Antwerpen). Originals of Ortelius's maps are popular collectors' items and often sell for tens of thousands of dollars. Facsimiles of his maps are also available from many retailers. A map he made of North and South America is also included in the world's largest commercially available jigsaw puzzle, which is of four world maps. This puzzle is made by Ravensburger, measures 6 feet (1.8 m) × 9 feet (2.7 m), and has over 18,000 pieces. 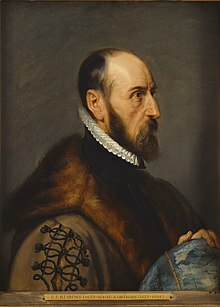 Abraham Ortelius in his work Thesaurus Geographicus … suggested that the Americas were "torn away from Europe and Africa … by earthquakes and floods" and went on to say: "The vestiges of the rupture reveal themselves, if someone brings forward a map of the world and considers carefully the coasts of the three [continents]." Ortelius's observations of continental juxtaposition and his proposal of rupture and separation were repeated by Alfred Wegener who published his hypothesis of continental drift in 1912 and in following years. Because his publications were widely available in German and English, and because he adduced geological support for the idea, Wegener is credited by most geologists as the first to recognize the possibility of continental drift. During the 1960s geophysical and geological evidence for seafloor spreading at mid-oceanic ridges became increasingly compelling to geologists (e.g. Hess, 1960) and finally established continental drift as an ongoing global mechanism. After more than three centuries, Ortelius's supposition of continental drift was proven correct. Abraham Ortelius, Theatrum Orbis Terrarum. Gedruckt zu Nuermberg durch Johann Koler Anno MDLXXII. Mit einer Einführung und Erläuterungen von Ute Schneider. Second unchanged edition (2. unveränd. Aufl). Darmstadt, Wissenschaftliche Buchgesellschaft, 2007. ^ The first work that contained systematically arranged maps of uniform size, intended to be published in a book, thus representing the first modern atlas, was De Summa totius Orbis (1524–26) by the 16th-century Italian cartographer Pietro Coppo. Nonetheless, this distinction is conventionally awarded to Abraham Ortelius. ^ Romm, James (February 3, 1994). "A New Forerunner for Continental Drift". Nature. 367 (6462): 407–408. Bibcode:1994Natur.367..407R. doi:10.1038/367407a0. ^ "Abraham Ortelius: Inventor of the Atlas - Google Arts & Culture". Google Cultural Institute. Retrieved 2018-05-20. ^ Peter Barber, "Ortelius' great world map", National Library of Australia, Mapping our World: Terra Incognita to Australia, Canberra, National Library of Australia, 2013, p.95. ^ Mercator, Gerardu; Karrow, Jr., Robert W. Atlas sive Cosmographicæ Meditationes de Fabrica Mundi et Fabricati Figura (PDF). Library of Congress. p. 2. Archived from the original (PDF) on 2016-03-10. ^ "Het Mercator-Orteliushuis te Antwerpen". Archived from the original on 2016-03-04. Retrieved 2013-03-25. ^ Kious, W.J. ; Tilling, R.I. (2001) . "Historical perspective". This Dynamic Earth: the Story of Plate Tectonics (Online ed.). U.S. Geological Survey. ISBN 0-16-048220-8. Retrieved 2008-01-29. ; Ortelius, Thesaurus Geographicus (Antwerp, (Belgium): Officina Plantiniana [Plantin Press] 1596), entry: "Gadiricus"
Binding, Paul (2003). Imagined Corners: exploring the world's first atlas. London: Review Books. ISBN 0747230404. Génard, P. (1880). "La généalogie du géographe Abraham Ortelius". Bulletin de la Societé royale de Géographie d'Anvers. 5: 312–49. Hess, H. H. (1960). "Nature of great oceanic ridges". Preprints of the First International Oceanographic Congress (New York, August 31 – September 12, 1959. Washington: American Association for the Advancement of Science. (A). pp. 33–34. Karrow, Robert J., Jr. (1993). Mapmakers of the Sixteenth Century and their Maps: bio-bibliographies of the cartographers of Abraham Ortelius, 1570. Chicago: Speculum Orbis Press. ISBN 0932757057. Koeman, C. (1964). The History of Abraham Ortelius and his Theatrum Orbis Terrarum. Lausanne: Sequoia. Rooses, Max (1880). "Ortelius et Plantin: note communiqué à M. P. Genard". Bulletin de la Société royale de géographie d'Anvers. 5: 350–356. van den Broecke, Marcel (2011) . Ortelius Atlas Maps: an illustrated guide (2nd ed.). Houten: HeS & De Graaf. ISBN 9789061943808.
van den Broecke, Marcel; van der Krogt, Peter; Meurer, Peter, eds. (1998). Abraham Ortelius and the First Atlas: essays commemorating the quadricentennial of his death, 1598–1998. Houten,: HeS Publishers. ISBN 9789061943884.
van Meteren, Emanuel (1670). Historia Belgica. Amsterdam. Wauwermans, H. E. (1895). Histoire de l'école cartographique belge et anversoise du XVe siècle. 2. Brussels: Institute nationale de géographie. pp. 109–61, 452–59. Wauwermans, H. E. (1901). "Abraham Ortels ou Wortels, dit Ortelius, géographe et antiquaire". Biographie Nationale de Belgique. 16. Brussels. pp. 291–332. Wegener, Alfred (July 1912). "Die Entstehung der Kontinente". Geologische Rundschau. 3 (4): 276–92. Bibcode:1912GeoRu...3..276W. doi:10.1007/BF02202896. Wehrenberg, Charles (2001) . Before New York. San Francisco: Solo Zone. ISBN 1-886163-16-2. Meganck, Tine Luk (2017). Erudite Eyes: friendship, art and erudition in the network of Abraham Ortelius (1527–1598). Boston: Brill. ISBN 978-9004341678. Wikimedia Commons has media related to Abraham Ortelius. Theatrvm orbis terrarvm, at the Library of Congress. This article incorporates text from a publication now in the public domain: Chisholm, Hugh, ed. (1911). "Ortelius, Abraham" . Encyclopædia Britannica. 20 (11th ed.). Cambridge University Press. pp. 331–332.